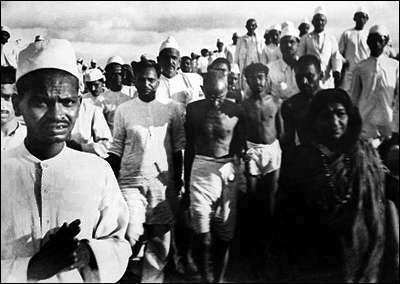 On March 12, 1930, Gandhi and 78 male satyagrahis set out on foot for the coastal village of Dandi, Gujarat, 390 kilometres (240 mi) from their starting point at Sabarmati Ashram. According to The Statesman, the official government newspaper which usually played down the size of crowds at Gandhi's functions, 100,000 people crowded the road that separated Sabarmati from Ahmedabad. The first day's march of 21 kilometres (13 mi) ended in the village of Aslali, where Gandhi spoke to a crowd of about 4,000. At Aslali, and the other villages that the march passed through, volunteers collected donations, registered new satyagrahis, and received resignations from village officials who chose to end cooperation with British rule. As they entered each village, crowds greeted the marchers, beating drums and cymbals. 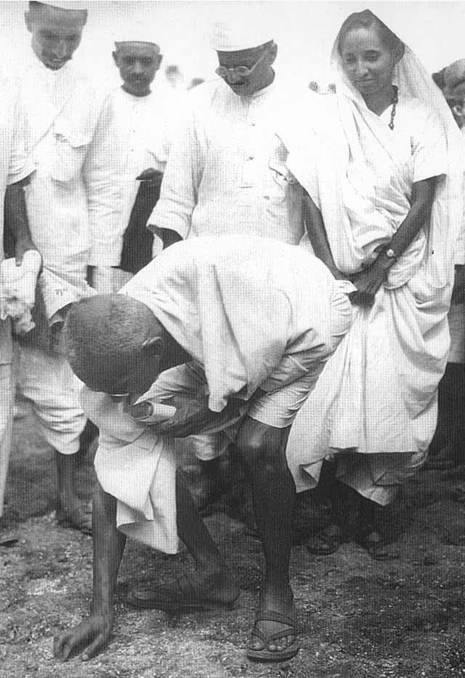 Gandhi gave speeches attacking the salt tax as inhuman, and the salt satyagraha as a "poor man's battle." Each night they slept in the open, asking of the villagers nothing more than simple food and a place to rest and wash. Gandhi felt that this would bring the poor into the battle for independence, necessary for eventual victory. Thousands of satyagrahis and leaders like Sarojini Naidu joined him. Every day, more and more people joined the march. At Surat, they were greeted by 30,000 people. When they reached the railhead at Dandi, more than 50,000 were gathered. Gandhi gave interviews and wrote articles along the way. Foreign journalists made him a household name in Europe and America. The New York Times wrote almost daily about the Salt March, including two front page articles on April 6 and April 7. Near the end of the march, Gandhi declared, "I want world sympathy in this battle of Right against Might." 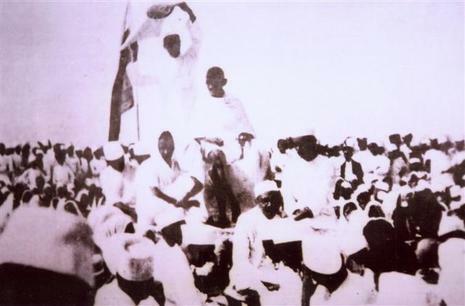 Events were to show that those who had scoffed at Salt Satyagraha and failed to see any connection between salt and swaraj (independence) had underrated Gandhi’s knack for organizing the Indian masses for corporate action. Gandhi was arrested on May 5. Just before his arrest he had planned a more "aggressive" phase of his non-violent rebellion by raiding and taking possession of the salt depots at Dharasana. The raid took place a fortnight after Gandhi’s arrest. There were 2500 volunteers. Before they advanced, Sarojini Naidu, the poetess, led them in prayer and appealed to them to be true to Gandhi’s teaching and to abstain from violence. Round the depot, a barrier of barbed wire had been erected and a ditch dug. As the first column of volunteers advanced, police officers ordered them to disperse. The volunteers advanced in silence even though scores of policemen fell on them and rained blows upon them. Not one man so much as raised his arm to fend off the blows. Webb Miller, an American correspondent, who witnessed the scene, wrote: "In eighteen years of reporting in twenty two countries, FI have never witnessed such harrowing scenes as at Dharasana. Sometimes the scenes were so painful that I had to turn away momentarily. One surprising feature was the discipline of volunteers. 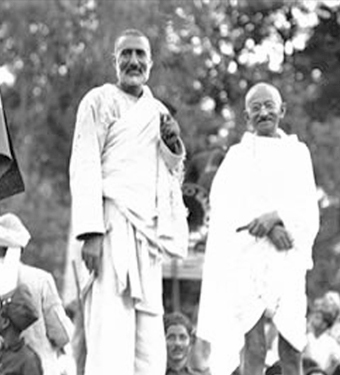 It seemed they were thoroughly imbued with Gandhi’s non-violent creed."